Why doesn't my average blood glucose match my A1C?! Not even close! What is the deal? Time Out. Why Use A1C? But before we get into that, let's briefly go over why A1C is used to approximate average glucose over ~3 months: -- As glucose enters your blood, it attaches to a protein in your red blood cells called "hemoglobin." This reason is pretty obvious. If you are not on a CGM, it's tough to get a full picture of your average blood glucose throughout the day. We generally check much more during the day than at night, and nighttime glucose values may be very different from daytime values. We also tend to test more often before eating (when glucose is typically lower), and less often after meals (when glucose is typically higher). Want to learn more about A1C? Download our Guide to A1C here! So, for most people, BG meter average doesn't accurately reflect average blood glucose over a full 24 hours. A1C, on the other hand, does. If you want your BG meter average to better reflect your A1C values, check more often! And make sure you check at various times throughout the day, including 1-3 hours after eating. This equation is based on data from a 2008 study of over 500 subjects (268 T1Ds, 159 T2Ds, and 80 non-diabetics) at 10 international centers around the world. The A1C values were all measured in a central laboratory, so differences in laboratory method or technique were not a factor. People were studied for 12 weeks, with two days of CGM and three days of 7-point glucose profiles each week. The BG meters used were carefully standardized and calibrated. 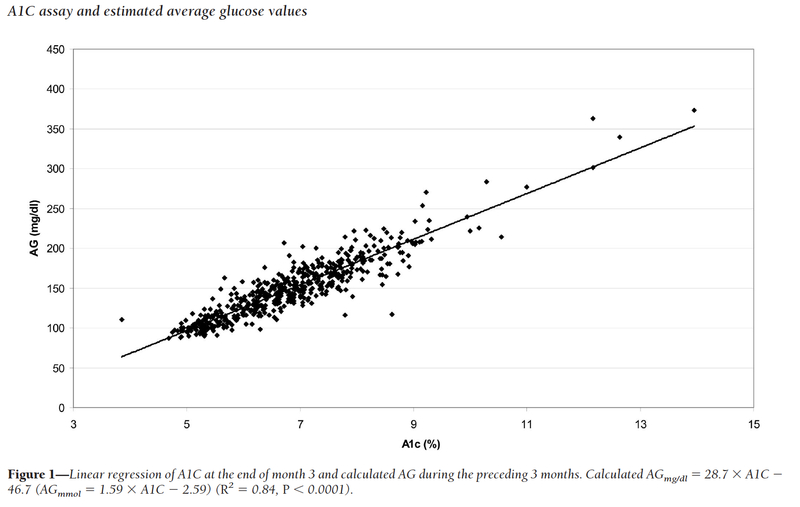 The graph below shows the data used to derive the relationship between average glucose and A1C. As you can see, there is A LOT of scatter. A number of data points are off the trend line by ± 1%. And for some A1C values, the spread is enormous... Check out the range of A1Cs for people with an average glucose of ~110 mg/dL -- it goes from below 4% to almost 9%! So, importantly, the study concluded that the equation could be used to convert A1C to average blood glucose values for "most patients." Not all patients, just "most." Results of a study of 507 subjects. Published in Diabetes Care 31:1473-1478, 2008. OK... 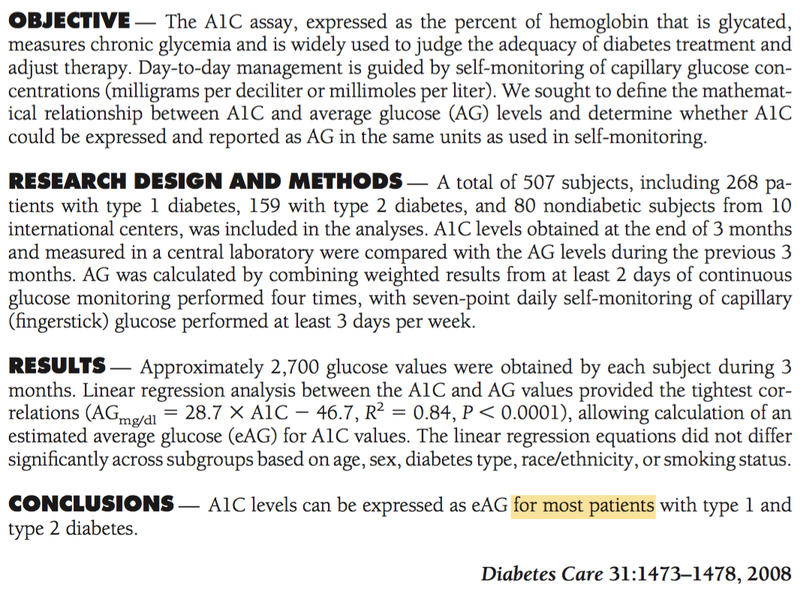 But why do so many people have A1C values that don't follow the equation? Answer: Biological variation. As it turns out, the biological processes that dictate A1C are not exactly the same for everyone. ● For some people, glucose attaches to hemoglobin very quickly. So even if their average blood glucose is 154 mg/dL (which would yield an estimated A1C of 7% using the above equation), their actual A1C may 8% or even higher. ● For others, glucose attaches to hemoglobin very slowly, and for the same average glucose of 154 mg/dL, they may have an actual A1C value in the 6% range or lower. ● For some, red blood cells turnover much faster than the typical ~3 months. The faster red blood cells turn over, the less hemoglobin can attach before the red blood cells die, which may lead to a lower-than-expected A1C result. ● For others, red blood cells live much longer than the typical ~3 months. The longer the cells live, the more glucose can attach to the hemoglobin, which may lead to a higher-than-expected A1C result. ● People who give blood, have any internal bleeding, or have some sort of anemia where the red cells break down faster than normal, will lose some older red blood cells with lots of glucose attached to the hemoglobin. As a result, the body will make new red blood cells with glucose-free hemoglobin and the A1C % will be lower than expected. ● People with spleen damage (or whose spleen has been surgically removed) may have more of the older red blood cells, because the spleen is responsible for removing older red blood cells from the body. As a result, these people may have a higher A1C % than expected. It's important to note here that A1C is not a perfect predictor of your risk of diabetes complications. It only predicts your complication risk if it accurately represents your average blood glucose. So, if there's reason to believe that your A1C isn't a good proxy for blood glucose, you and your healthcare team should not base your diabetes management plan on your A1C. Instead, your plan should be based on your CGM average or BG meter average (assuming you've collected enough blood glucose values at various times out throughout the day). Your average blood glucose is not really intended to predict your A1C. Rather, A1C is supposed to provide a way to estimate your average blood glucose over time. Any A1C-based prediction may be off by as much as 20 to 25 mg/dL. For some people, it may make more sense to base diabetes treatment decisions off of their BG meter average than their laboratory-measured A1C.